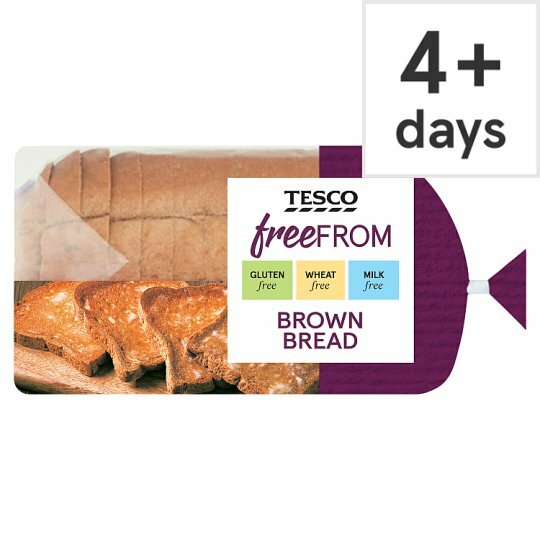 Gluten free sliced brown bread. INGREDIENTS: Water, Rice Flour, Tapioca Starch, Maize Starch, Potato Starch, Bamboo Fibre, Rapeseed Oil, Dried Egg White, Psyllium Husk Powder, Humectant (Vegetable Glycerol), Yeast, Stabilisers (Hydroxypropyl Methyl Cellulose, Xanthan Gum), Sugar, Salt, Apple Extract, Buckwheat Flakes, Preservatives (Calcium Propionate, Potassium Sorbate), Cocoa Powder. Defrost thoroughly for a minimum of 2 hours in the fridge. Once defrosted, do not refreeze.